I spent most of last week on Hilton Head Island -- I know: real hardship duty :-) -- but I was working. And having a great time. I'm a member of SIGMA (which, despite all those caps, is not an acronym). SIGMAns are authors of hard SF -- but first (and in many cases, still) we were scientists, physicians, or engineers. We consult on matters of futurism, often -- where the public interest is involved -- pro bono. As the logo would have it, SIGMA is The Science Fiction Think Tank. Bringing me to the just concluded Hilton Head Workshop 2014: A Solid-State Sensors, Actuators and Microsystems Workshop. The event's scope extends to -- though, curiously, the term is omitted from the name -- nanotechnology. Nor was this just any such workshop, but the 30th anniversary edition. SIGMA founder and onetime White House science fellow Dr. Arlan Andrews. Interstellar Woman of Mystery and twenty-year veteran at NASA, Stephanie Osborn. Polymath and onetime manager at Aerospace Corporation, Boeing, and other interesting places (and longtime Byte columnist), Jerry Pournelle. Beyond my own high-tech career, I have to my credit nanotech-intensive novels and a novelette featuring both gnat bots and nanotech. Deploying the array entails (a) making an opening into the skull and (b) gently inserting the array into the brain. You can interact in that manner with only near-surface neurons. The set of neurons you can reach (while occasionally impaling some?) is geometrically constrained. And once you have inserted the probes? Within a month or so, glial cells (the brain's immune system) encase the probes with, well, we'll call it scar tissue. At that point the readouts fade away unless (gag!) you wiggle the probes a bit. Sounds like something you'd only want to do (if at all) with a lab rat. The human brain is comprised, in round numbers, of 100 billion neurons. 100 trillion synapses. At the observed doubling rate for increasing the density of these tiny probe arrays, it will be possible (ignoring, for the moment, the matter of placing all those probes) to read out every neuron in a human brain ... around, more or less, 2240. As a computer engineer and an SF author, I'm doubly enamored with the concept of a neural interface: an Internet connection direct to my brain. I can't say I want to have my skull opened, though, or to wait, well, far more years than I'm apt to have. I see no reason we can't achieve neural interfaces in thirty years. Don't implant -- go poking holes into the brain with -- all those electrodes. Grow the electrodes in situ. Start with a "seed" small enough to insert through any of the cranium's many natural openings -- nerve fibers and blood vessels have to connect with the brain, after all. It's surely less intrusive, for example, to maneuver something up through the nose (through the olfactory foramina) than to saw open the skull! The seed has a nanocomputer to control its operations. Carbon scavenged from the CSF, in part from the metabolized glucose, is used to grow the electrodes. That is, the electrodes will be carbon fibers, perhaps carbon nanotubes. Such fibers can be very thin. They are excellent conductors. They do not trigger an immune response. With trace amounts of other elements, carbon nanotubes can be used to create electronic devices to read -- and stimulate -- neurons. The electronics of the seed itself is CNT-based. CNT-based circuits are compact, operate on a mere trickle of power, and won't trigger any immune response. The brain runs on about 20 watts of power. A small bit of the energy available in the brain's biochemical soup will suffice to run the seed and drive the growth of electrodes. Exactly where will the seed extend the electrodes? How will it know? Researchers are already using scanning technologies like fMRI and DTI to map the detailed neural circuits of the brain, and scanning resolution will continue to improve. The nanocomputer, preloaded with such maps, has (at the least) a starting point. 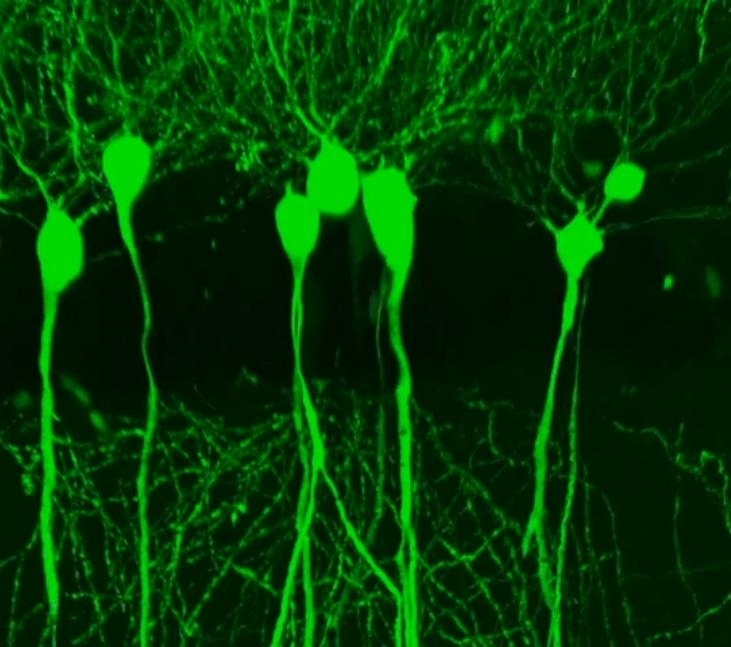 Perhaps it will fine-tune placements for each individual's unique neural wiring, informed by sensors at the tips of the growing fibers. Two places where fibers will surely terminate: the auditory cortex and the visual cortex. Forget Google Glass! Your neural interface will write directly to your mind's eye and speak directly to your mind's ear. Other fibers will integrate with a brain component(s) responsible for language processing, such as the Broca area, allowing you to think commands at the interface. The implant that I proposed mediates one final function: communicating with the external world. A small subset of the circuits and fibers grown by the seed will collectively implement an RF (Bluetooth?) transceiver and antenna sufficient to transmit to, and receive from, beyond the skull. If all that proves possible -- and I believe it, or something very like it, will -- then (with a bit of software) we'll have direct brain/Internet connectivity. Real-time access to the cloud. Memory backup to, and the full resources of, the cloud. With only a bit more software, via brain/cloud/brain connectivity, we'll have, in effect, telepathy.